Monday morning saw my paddle buddy and myself meeting with Phil Clegg (of Sea Kayaking Anglesey) at Anglesey Outdoors and deciding where to paddle. 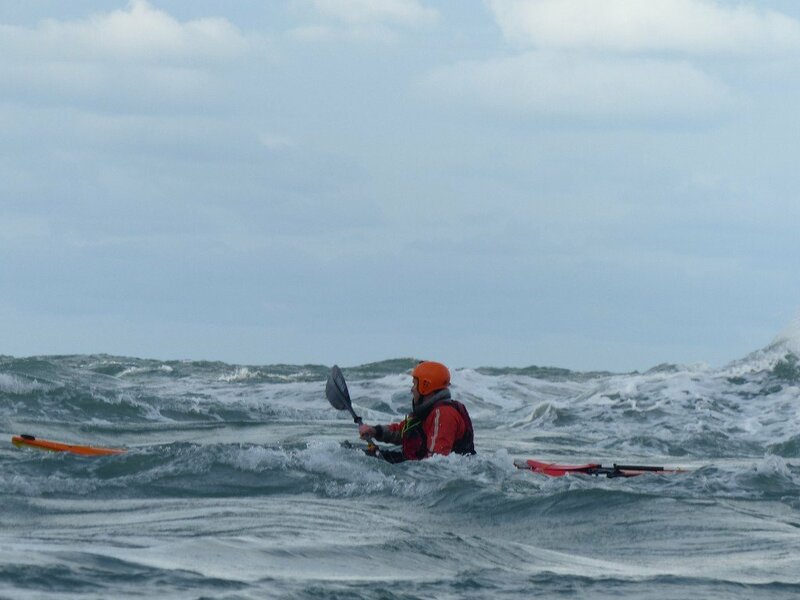 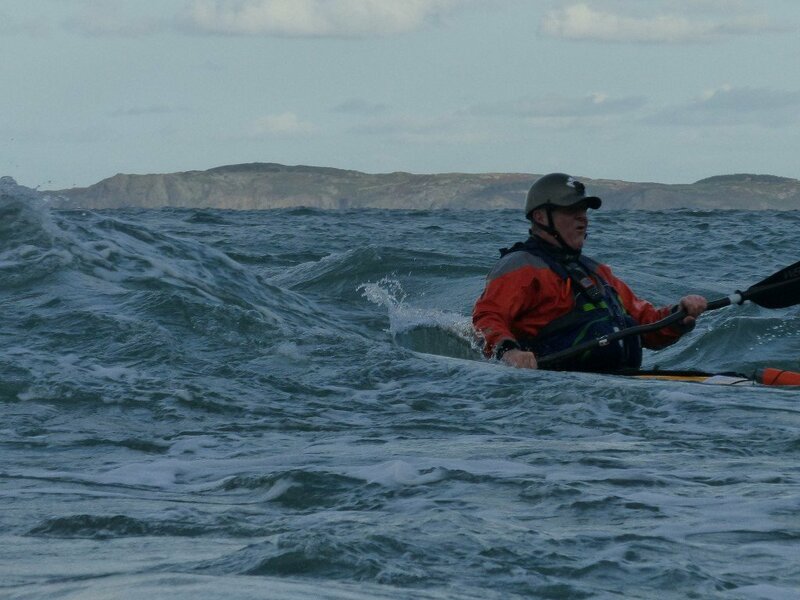 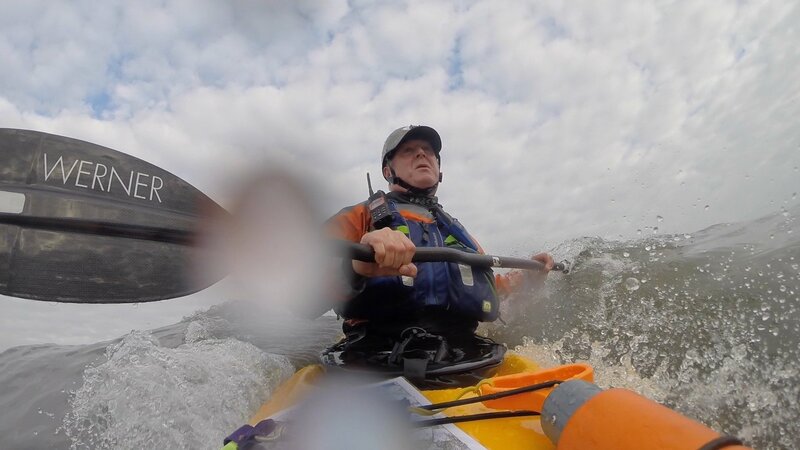 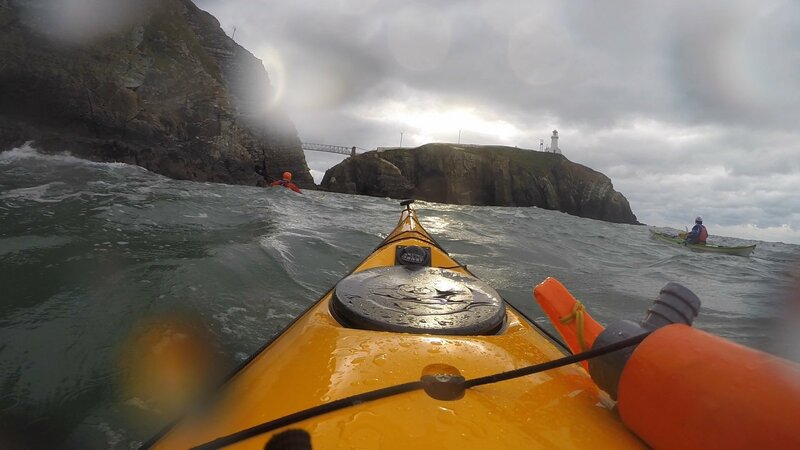 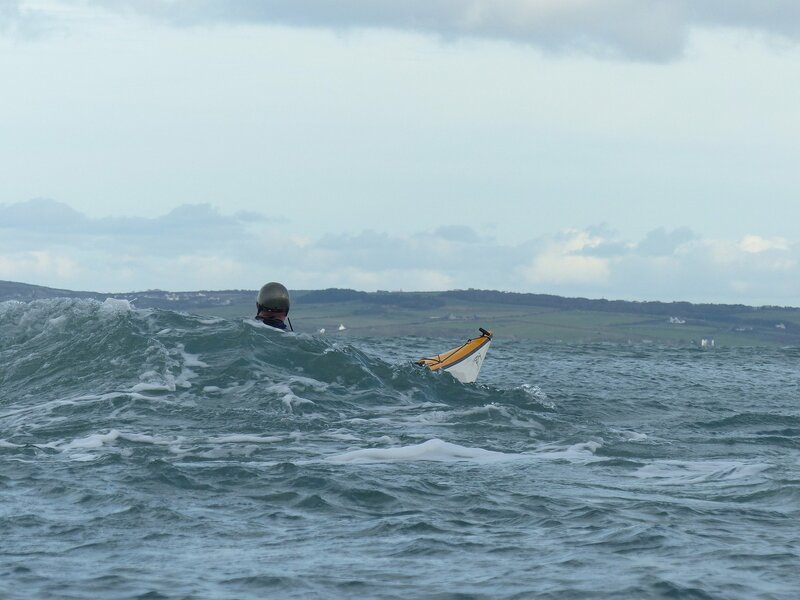 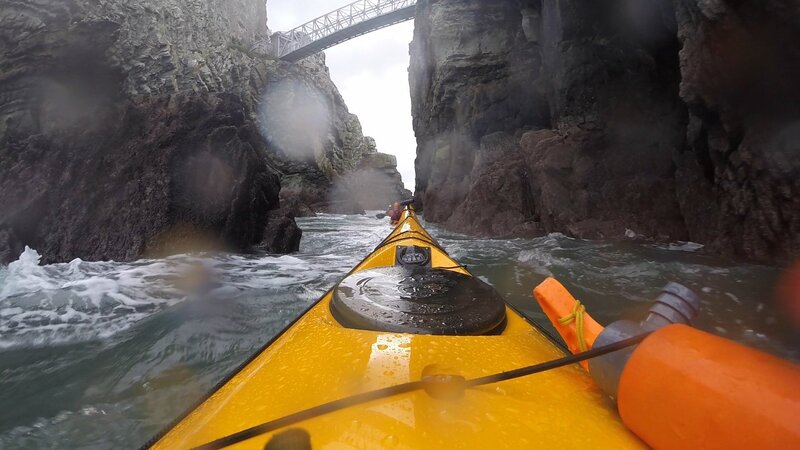 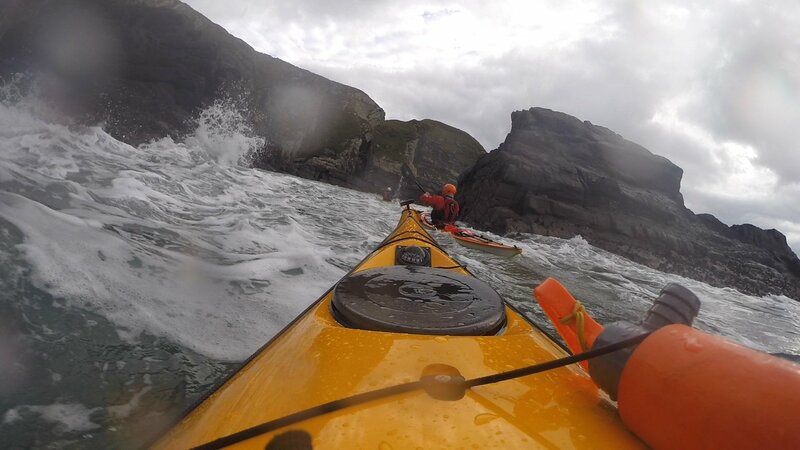 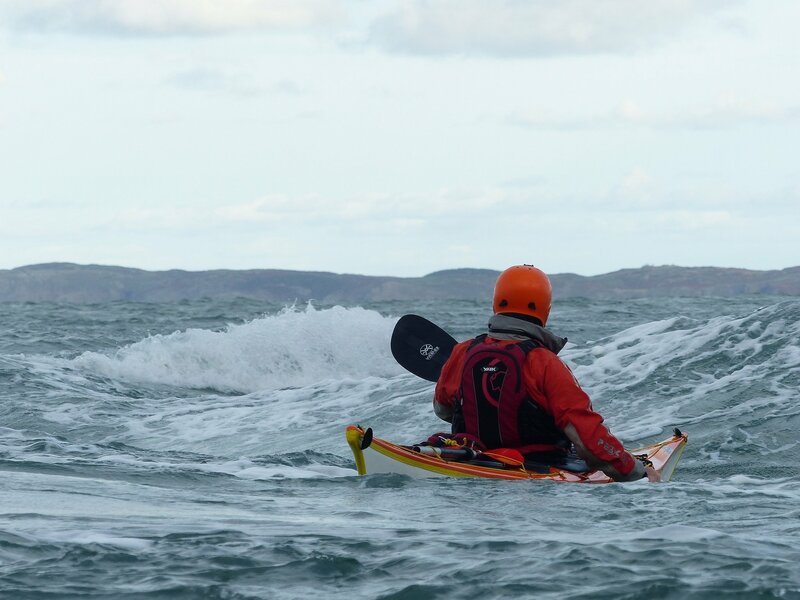 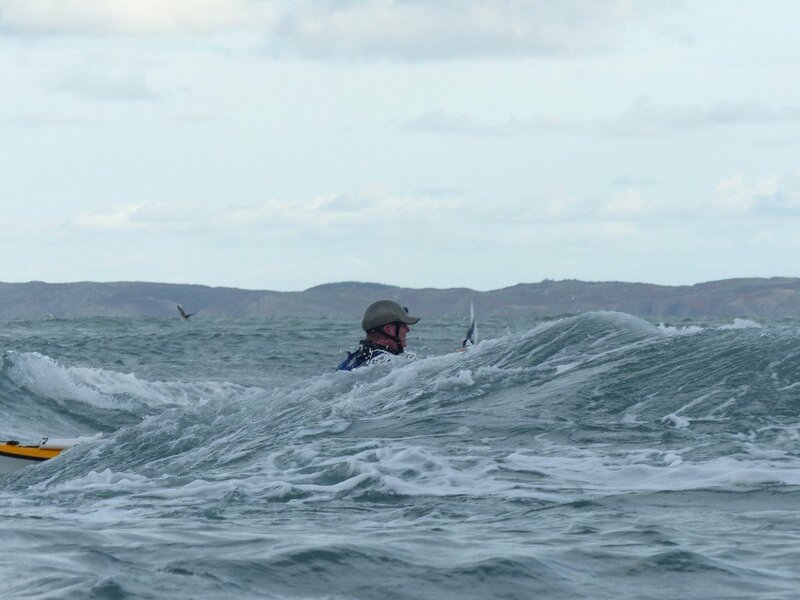 After lots of discussion and referencing of tide tables, guidebooks, weather forecasts, surf/swell forecasts etc, a good mug of tea and using Phil’s expert knowledge of these races, we decided to paddle, Penrhyn Mawr and the Stacks. 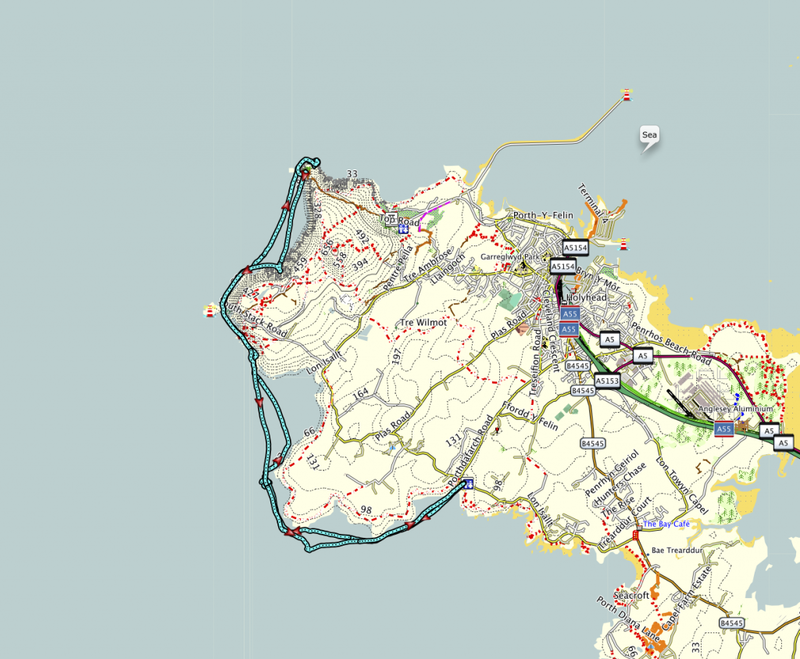 Whilst we were at Anglesey Outdoors, Phil showed us his Journey planner, which I rather liked. 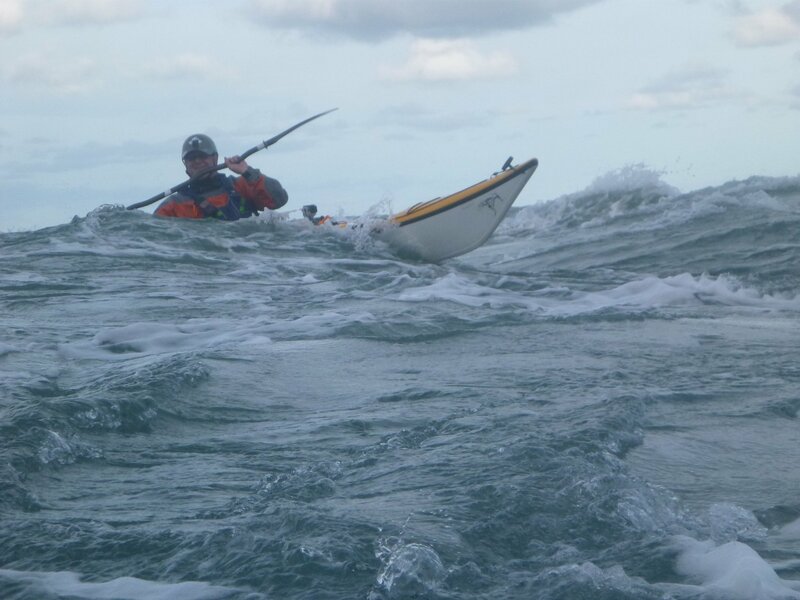 Rather than having lots of text, which is nigh on impossible to read when on the water, especially when it gets a little rough. 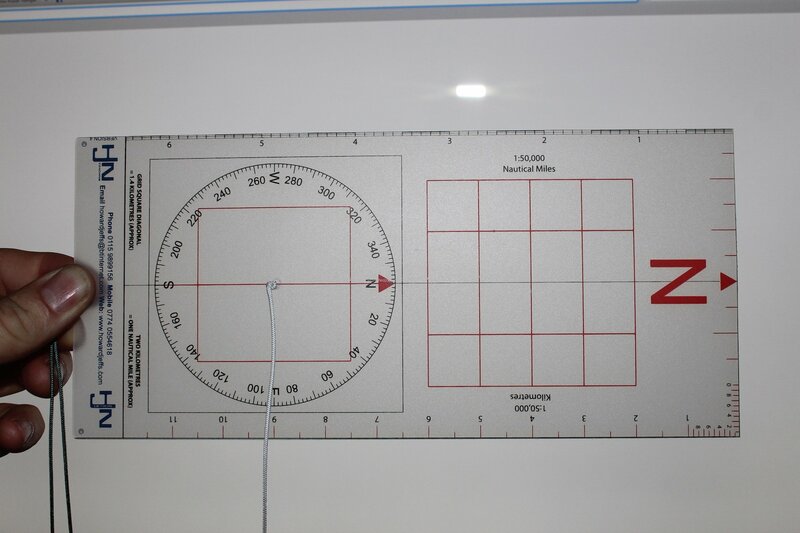 Phil’s journey planner is very pictorial solution. 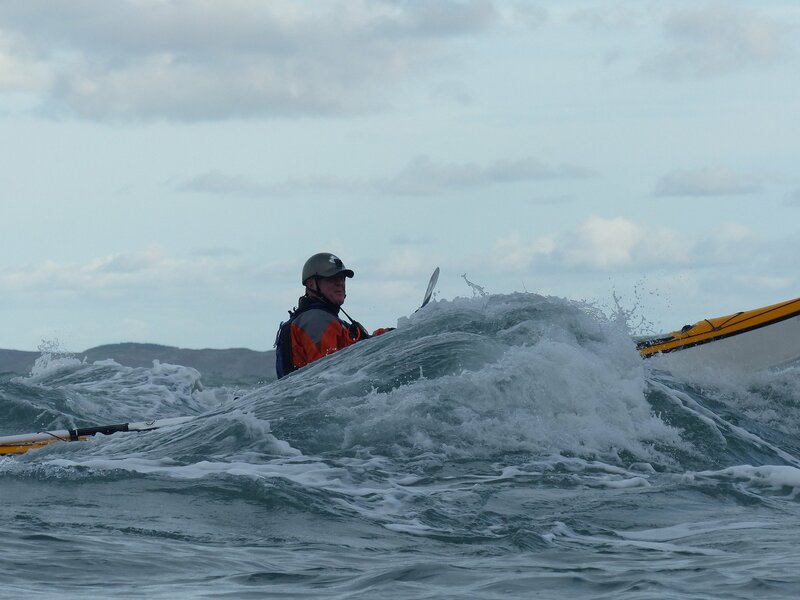 A glance at the planner on the water and you have (so long as you have added the detail) a pictorial view of what the wind, waves, tide are doing on your journey. 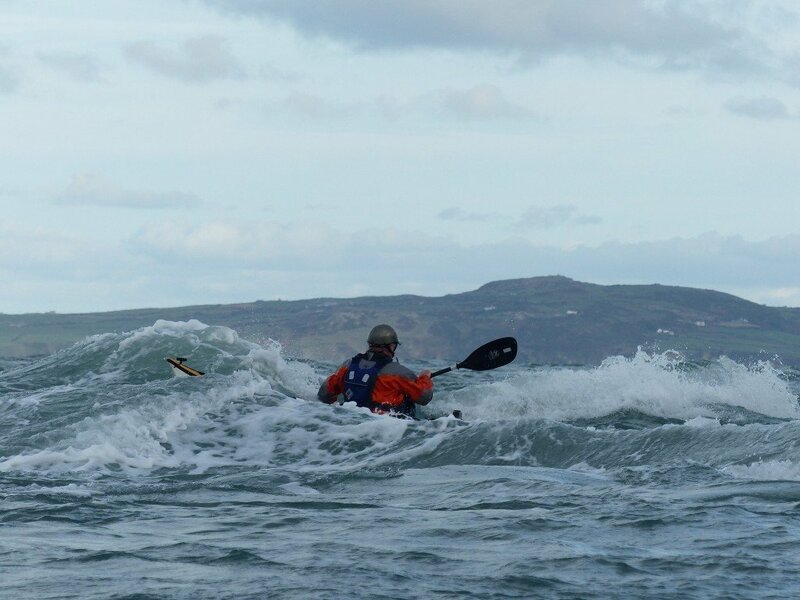 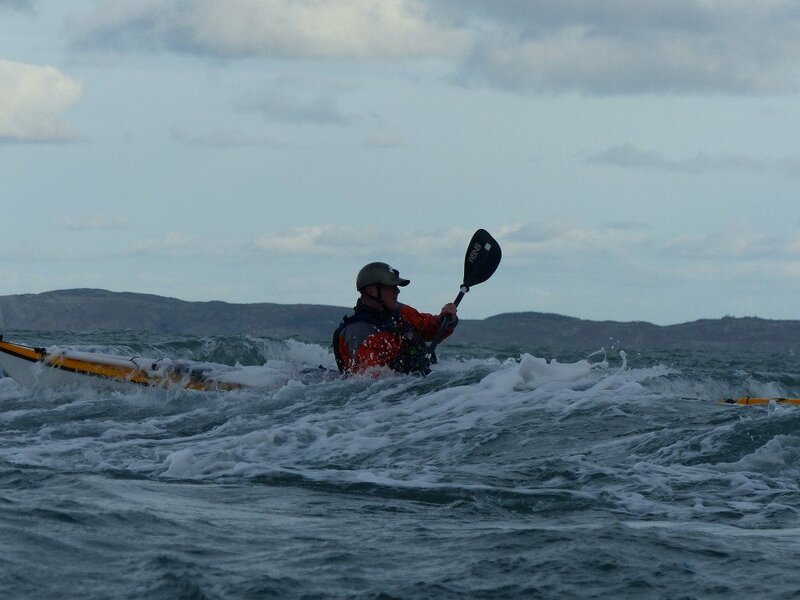 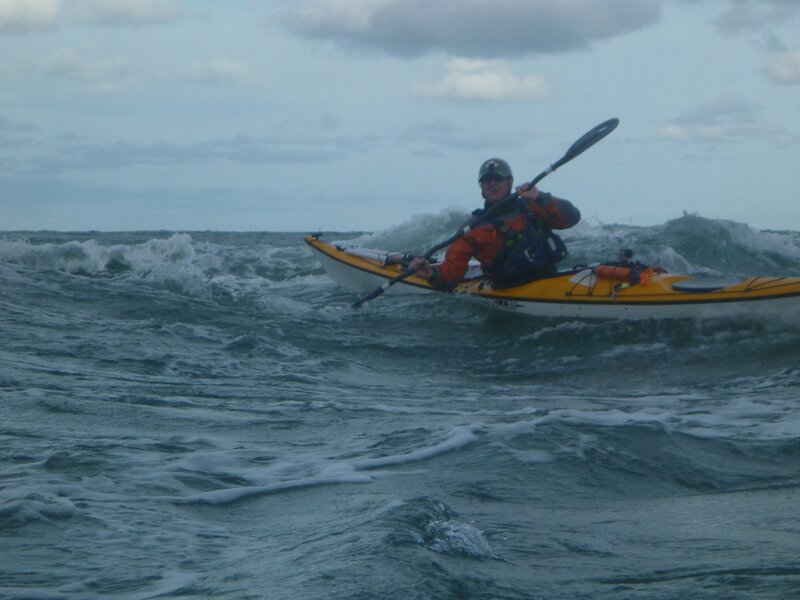 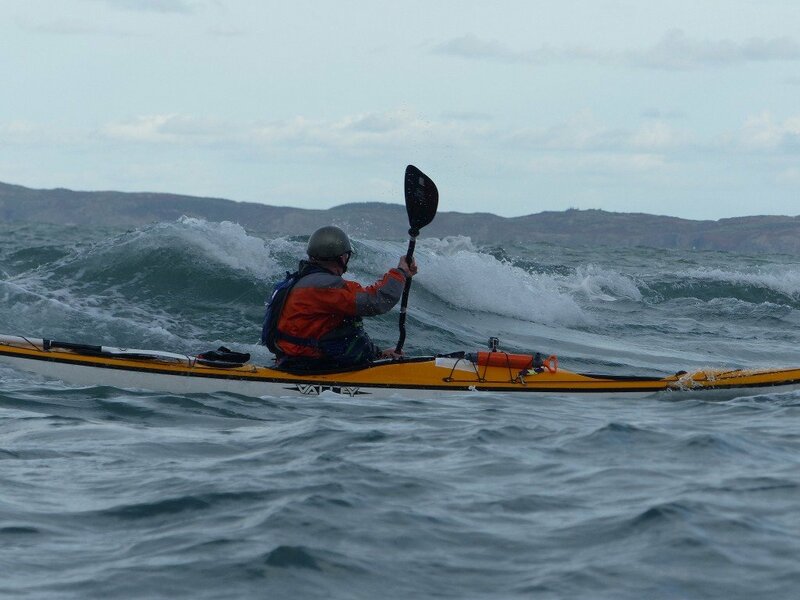 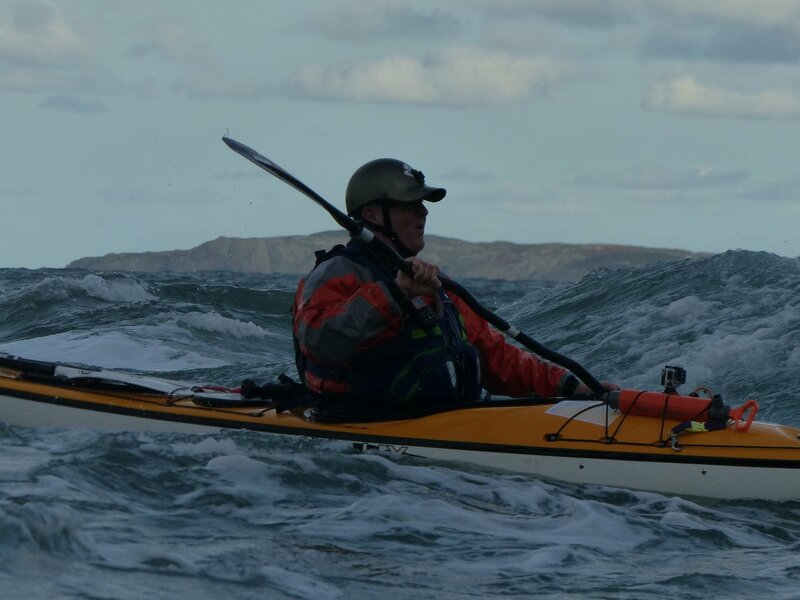 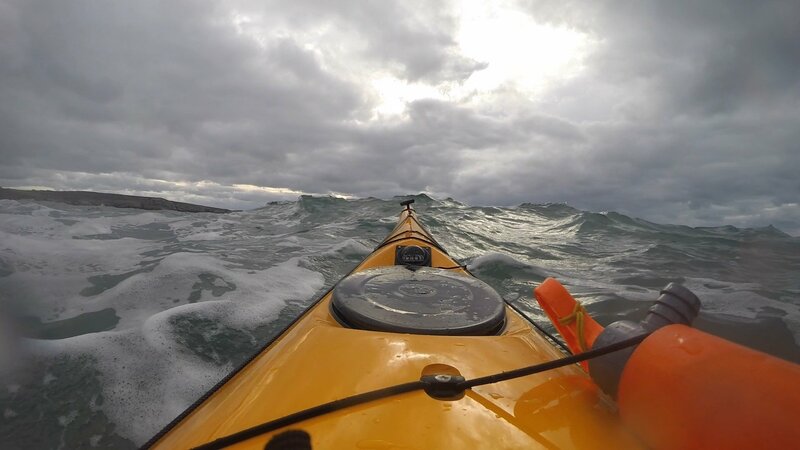 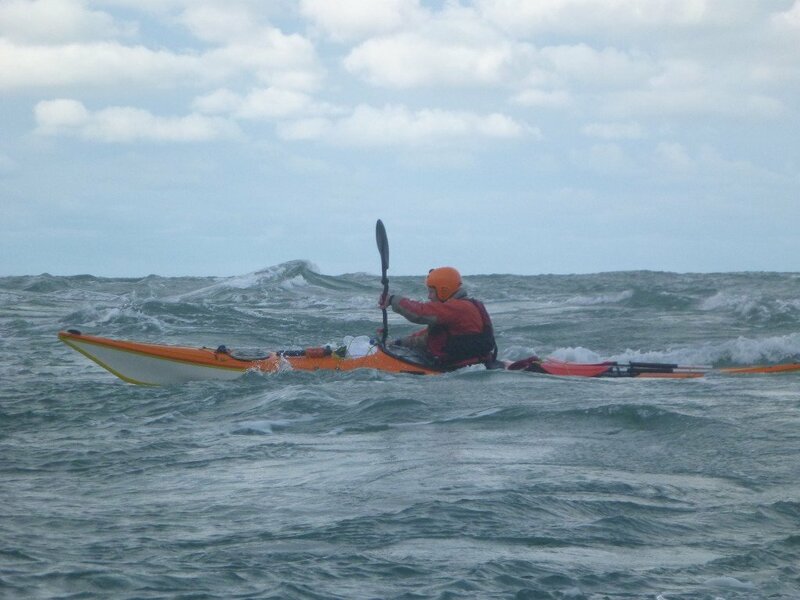 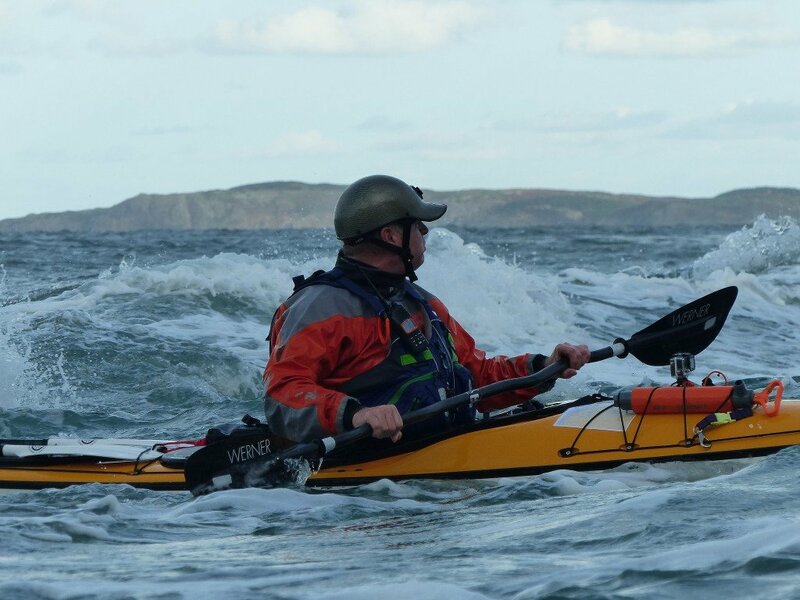 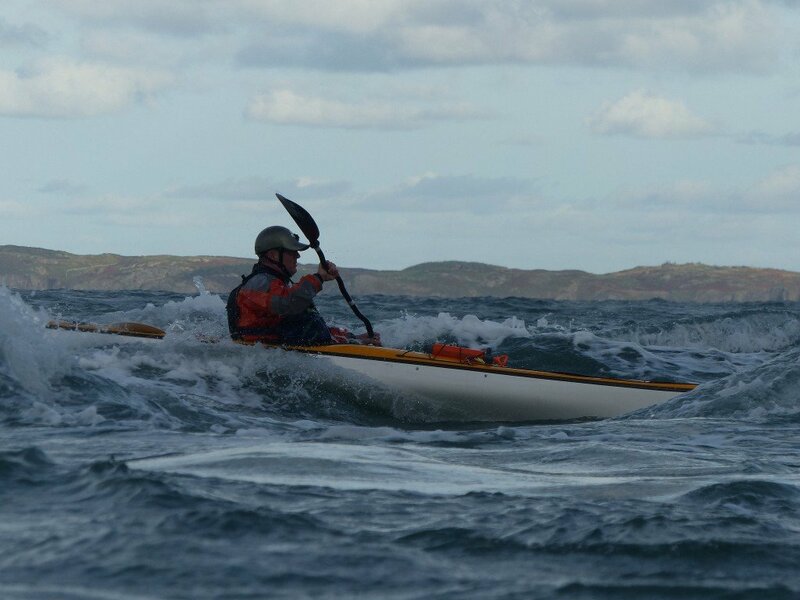 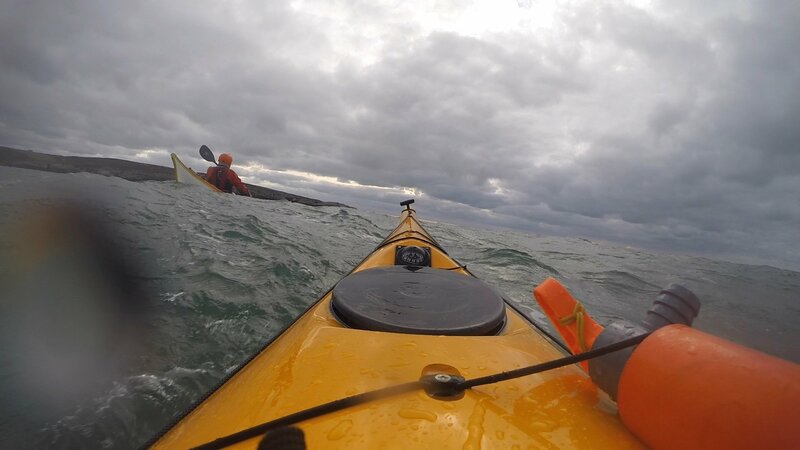 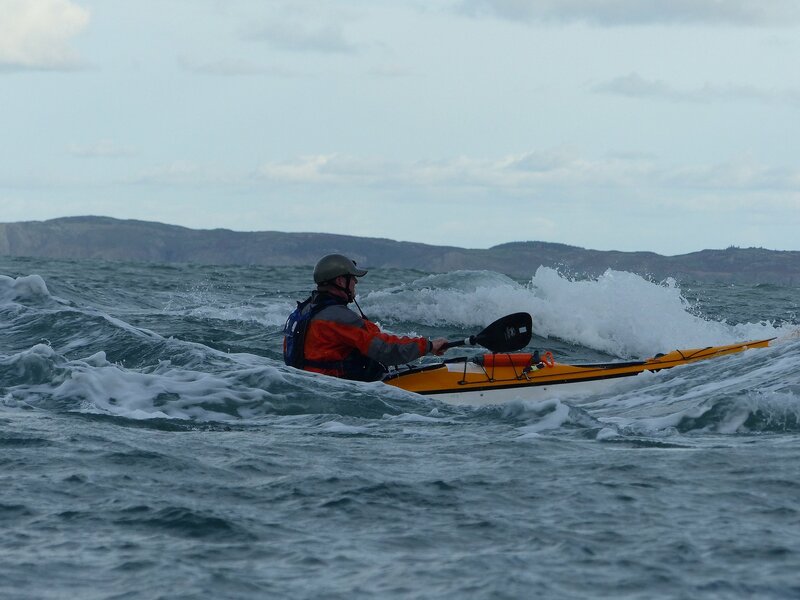 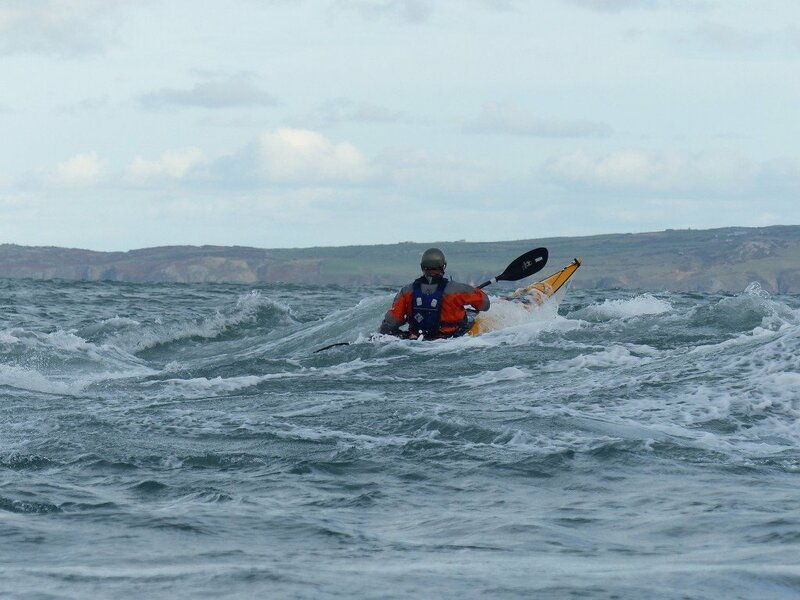 If you would like a copy of Phil’s planner, I suggest you get yourself on one of Phil’s courses at Sea Kayaking Anglesey. 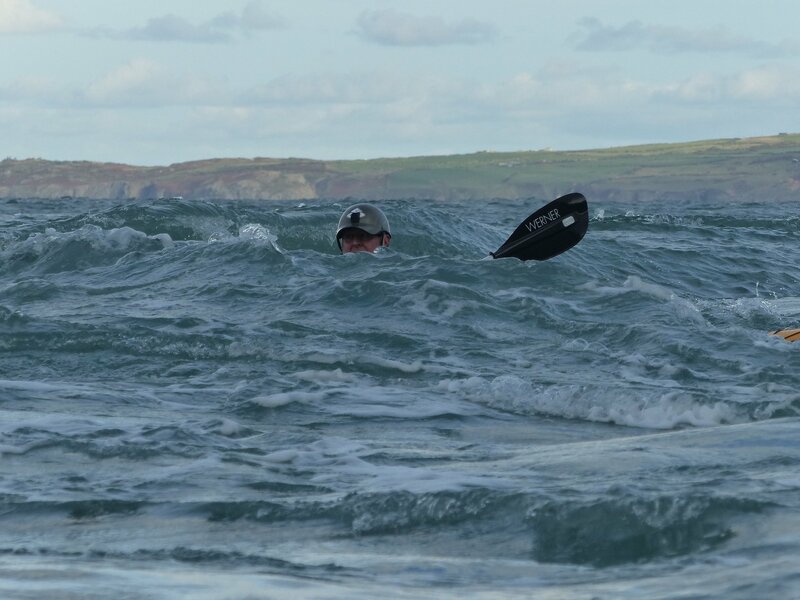 Anyway, back to our days paddle. No sooner had we set off, my GoPro turned itself off and I couldn’t get it going again; not at least until we stopped for lunch. 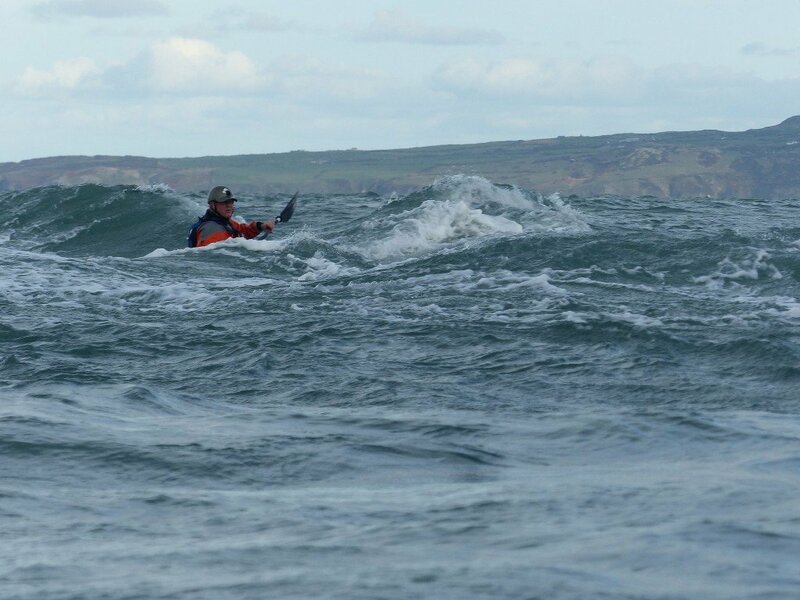 This unfortunately meant that I was unable to capture any footage of the tidal races. 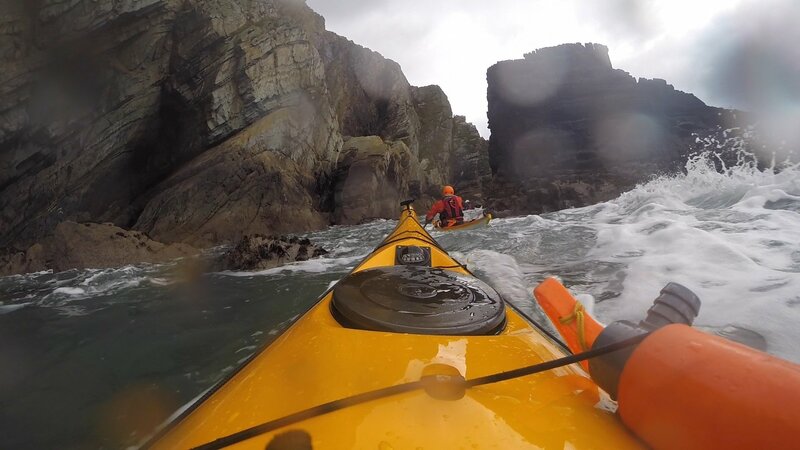 So most of the exciting/good pictures below were taken by Phil – thanks Phil. 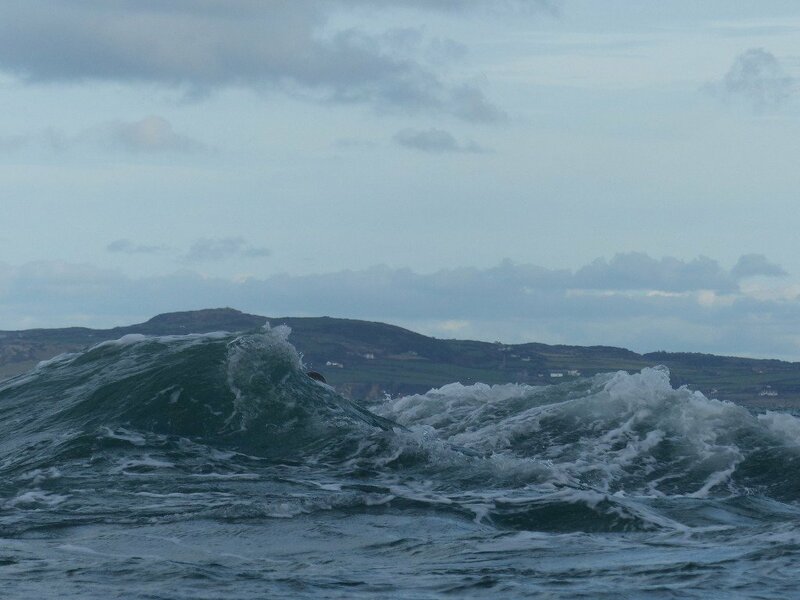 It is difficult to say, but I think the pictures with land visible in the distance are most likely to be taken at North Stacks. 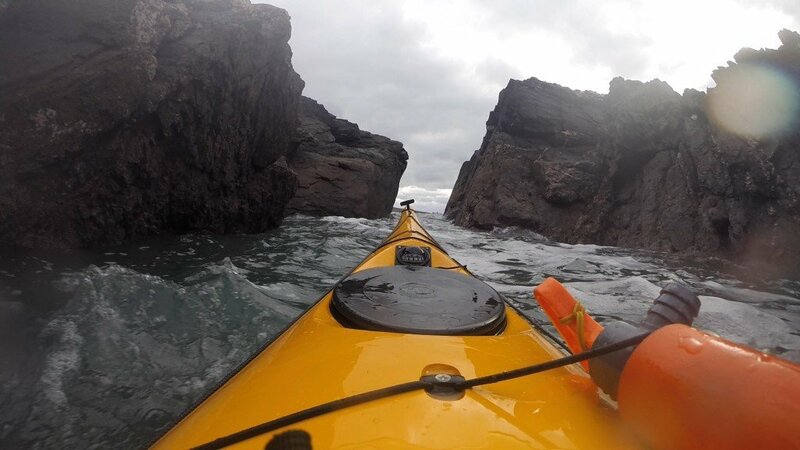 The others without any visible land in the background are either Penrhyn Mawr or South Stacks. 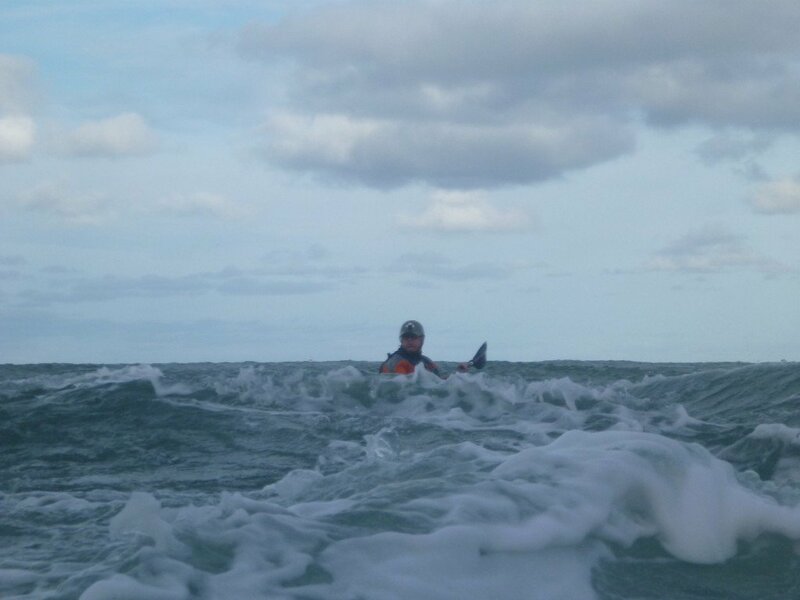 Hmmm… I really don’t know as I was too busy having fun. It was pretty wild out there. Well we did ask for big water. 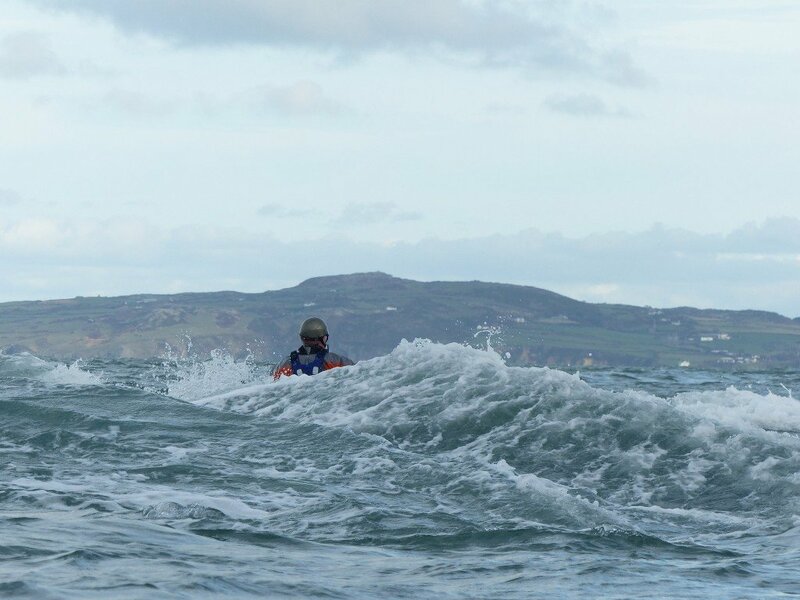 Despite it being fairly messy out in the races, some good surfs were had. 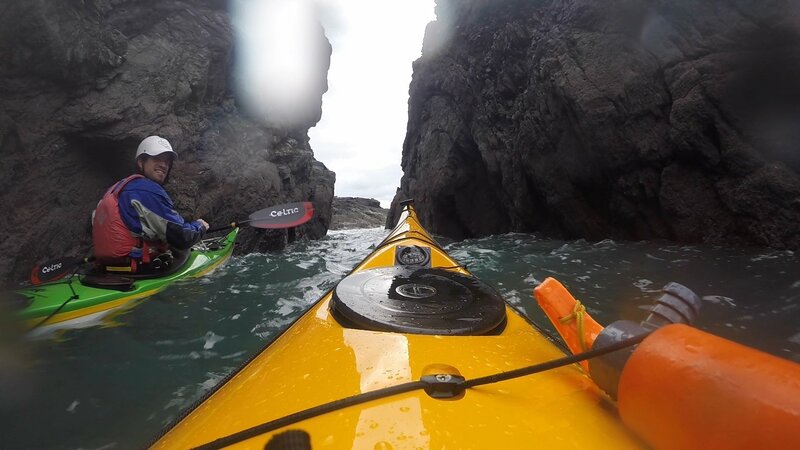 Once we finally stopped for lunch I was able to sort my GoPro out and get it working. 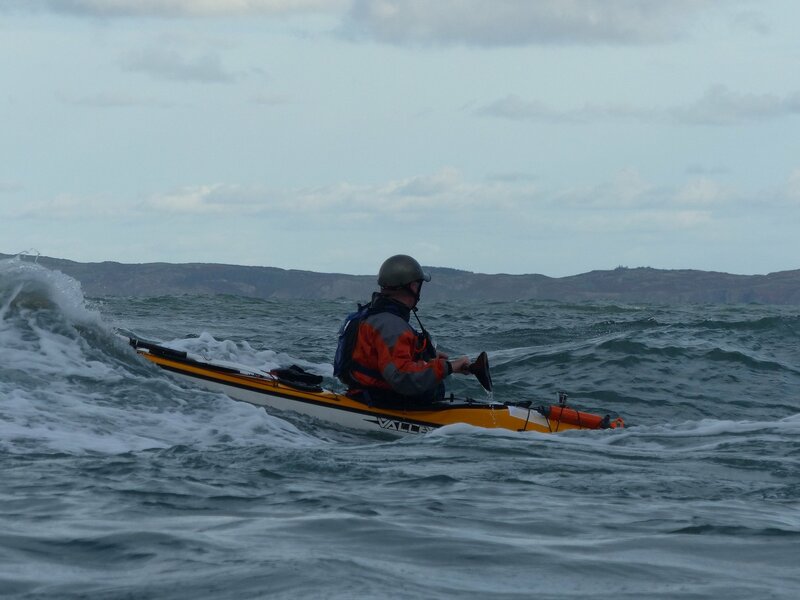 I was able to capture the images below on our return journey. 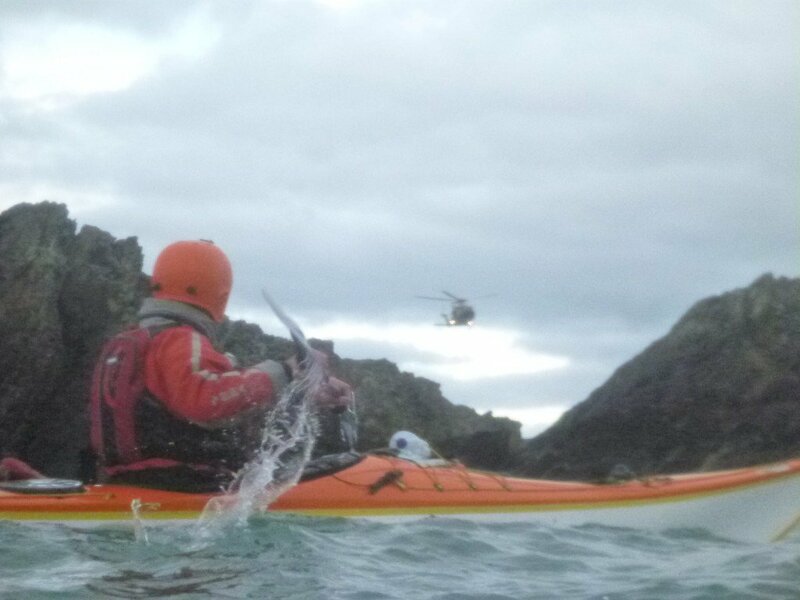 The helicopter wasn’t for us! 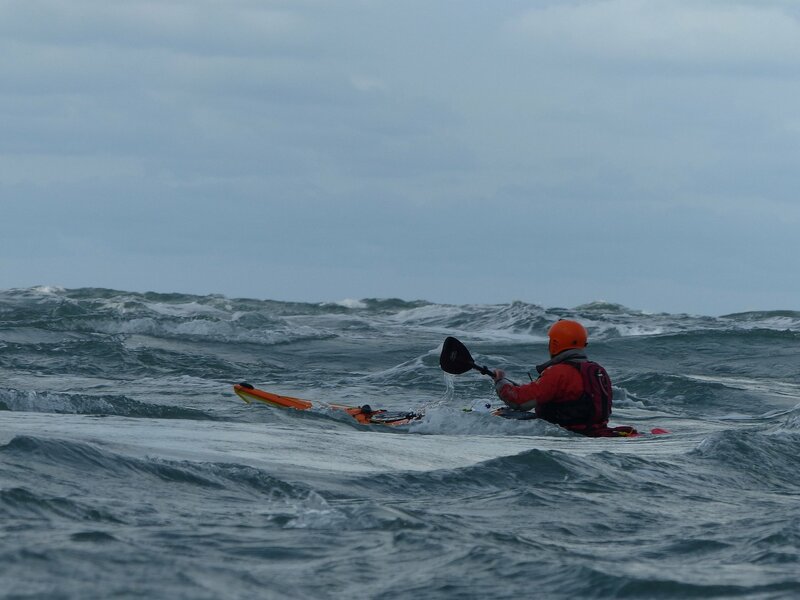 It was just practicing. 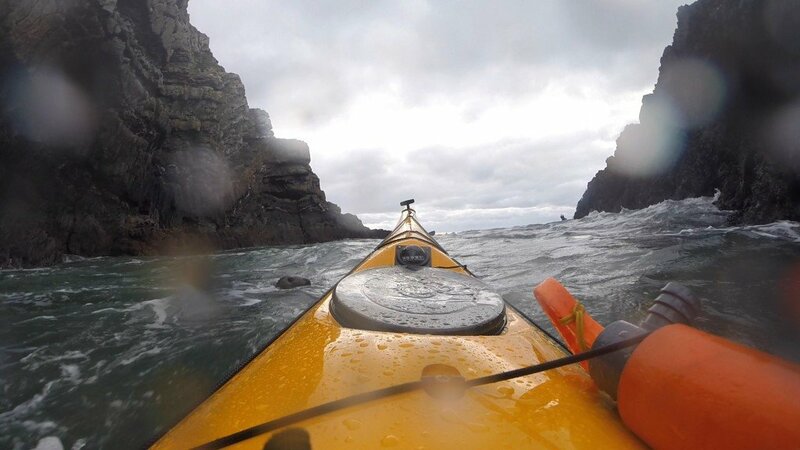 The days paddle to North Stacks and back was about 12 miles according to my GPS. 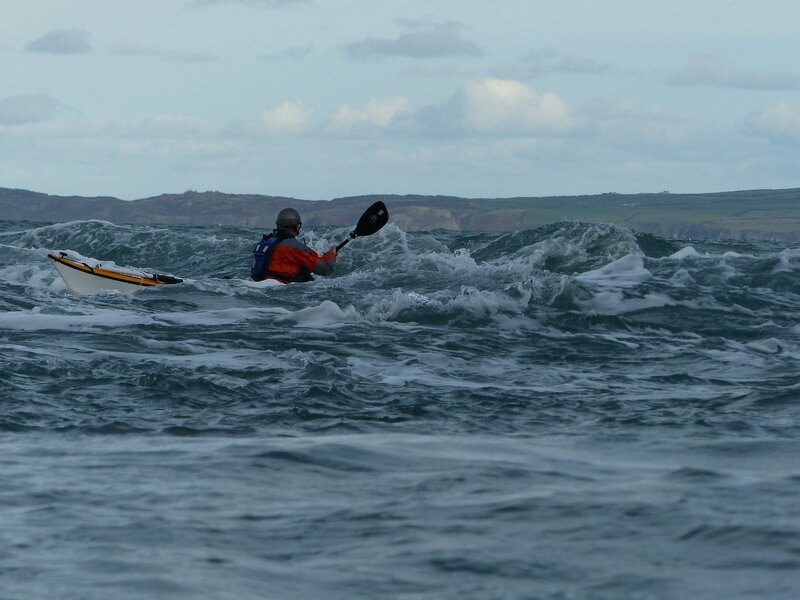 But with all the excitement of paddling in the races and rock hopping it felt a lot, lot longer. 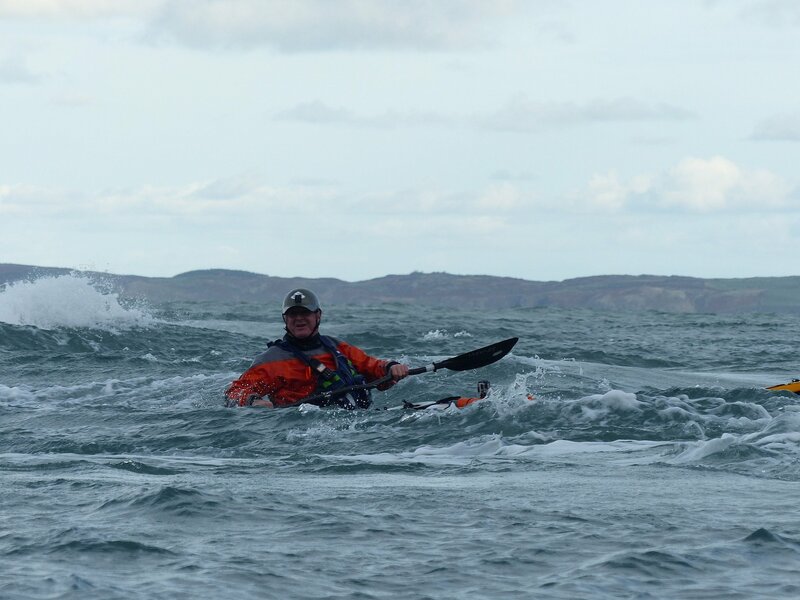 My paddle buddy was looking pretty exhausted when we got back to our accommodation and excellent facilities at Anglesey Outdoors. 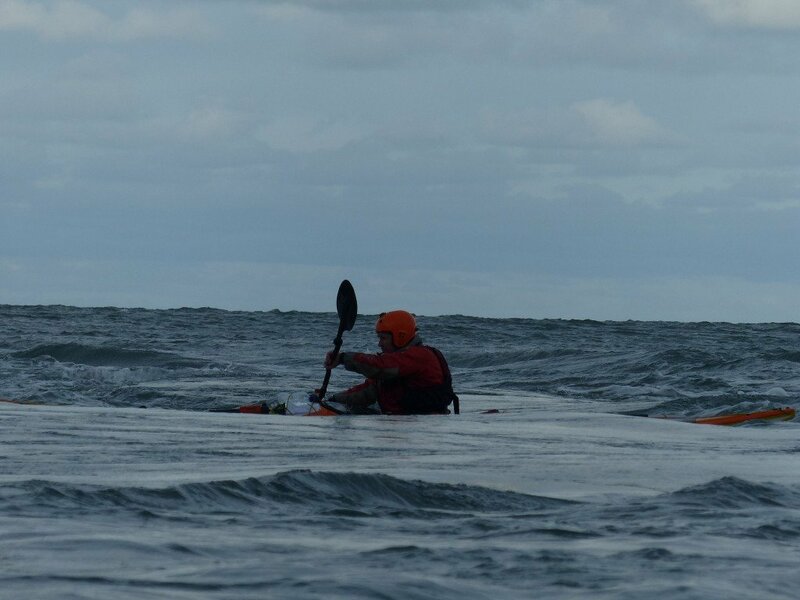 But both our grin’s said it all really. 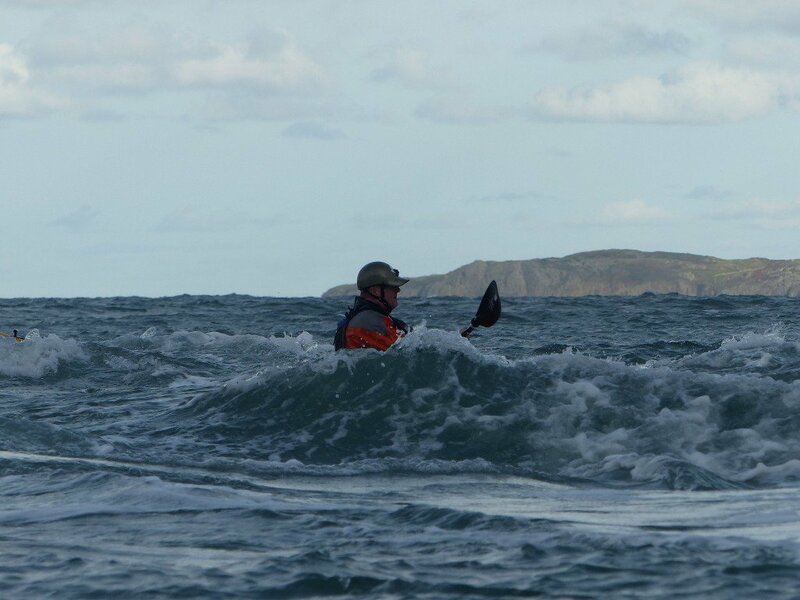 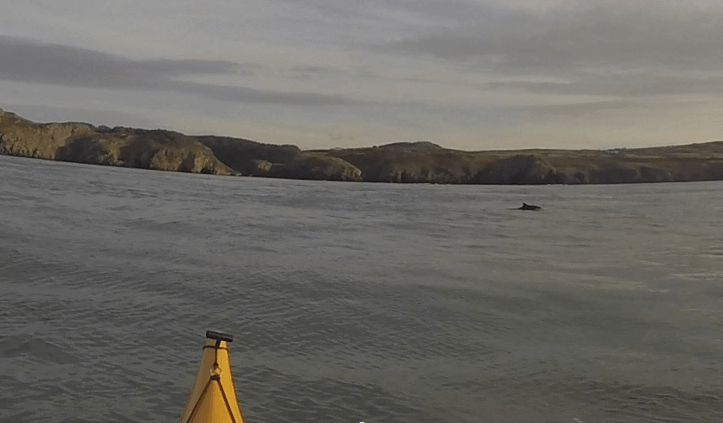 The best days paddling ever!